I have a major love affair with Puff Pastry and any recipe that requires it grabs my attention right away. While I was going through my grandmother’s little recipe notebook I came across a recipe for vol-au-vent. Then I remembered having seen a recipe for vol-au-vent in Ms. Montazemi’s cookbook too. After talking to my mom about it she reminded me that my grandma has a bunch of recipes from the classes that she took with Ms. Montazemi. So I had to make it and see for myself what it was all about!!! Well me me tell ya, this recipe rocked. It is made with a delicious chicken, mushroom, and peas with Béchamel sauce filling that is out of this world good. I ended up tweaking the amount of ingredients a bit from the original. Today’s recipe make 14 vol-au-vent. 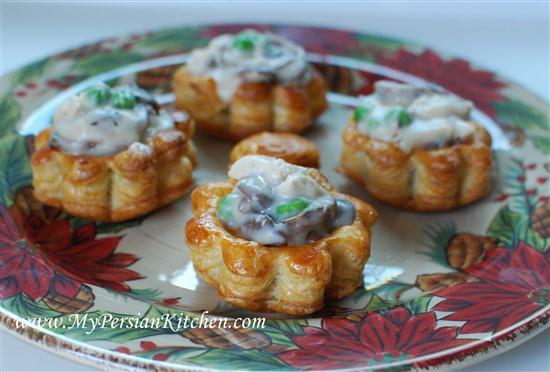 Vol-au-vent literally means wind blown, the name is a reference to the lightness and flakiness of the puff pastry. These are great appetizers for your parties. The timing could not have been more perfect as I was looking for recipes that go well this time of the year.The best part of all is that they are not hard to make and will make an impression!! You can make the filling with any part of the chicken. 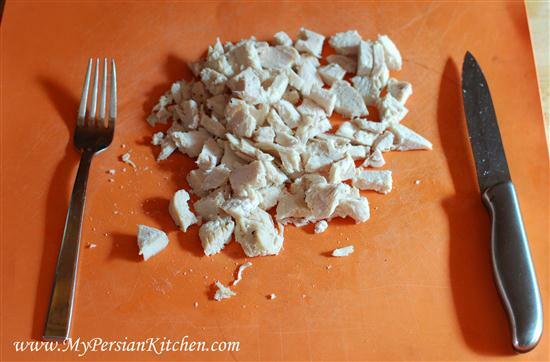 Chicken with bone is great because of the flavor that the bone adds to the whole dish. I had chicken breast at hand and also wanted to save a little time as far as not having to debone the chicken. Season chicken with salt and pepper. 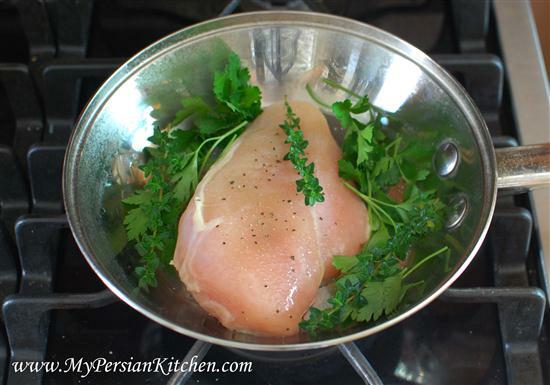 Add some aromatic herbs such as parsley and thyme along with 1/2 cup water to a pan. Cover and cook until chicken has cooked all the way through. In the mean time slice mushrooms. Saute in 1 tablespoon of butter. Season with salt and pepper. 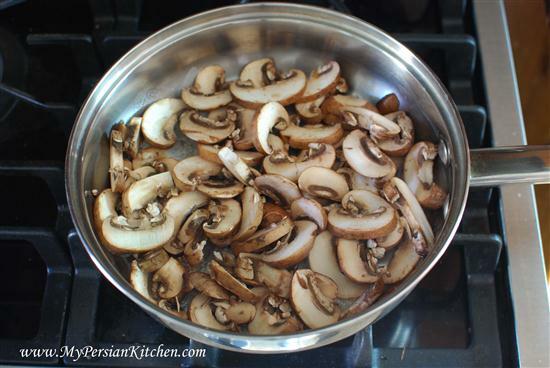 Cook until most of the mushroom juices have evaporated and there is only about 1 to 2 tablespoons of it left. 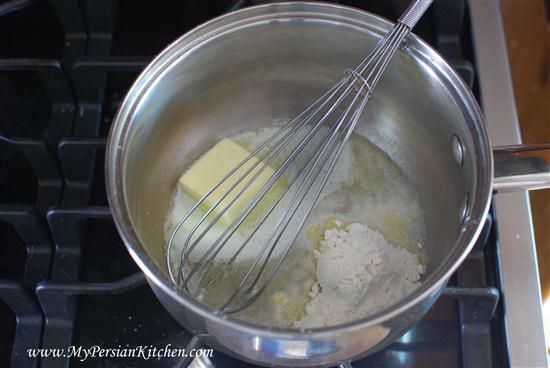 Make a Béchamel sauce by melting 4 tablespoons of butter and adding flour to make a roux. Whisk constantly until the flour turns into a nice golden color. 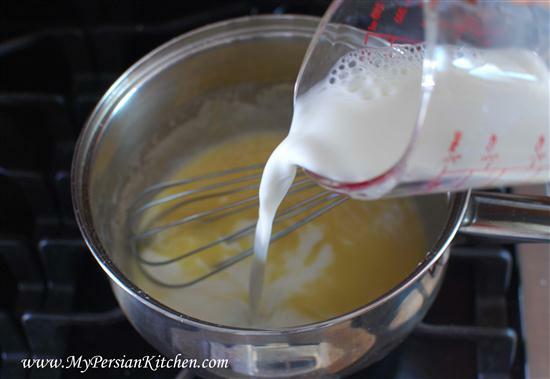 Slowly pour in milk and continue whisking making sure that there are no lumps. Add nutmeg and a bit of salt. 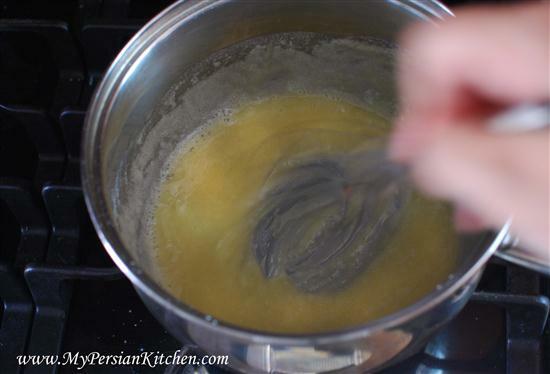 Continue whisking until the mixture firms up a bit. Once done cover and set aside. Once the chicken is done remove from pan reserving pan juice. Dice chicken into small pieces. 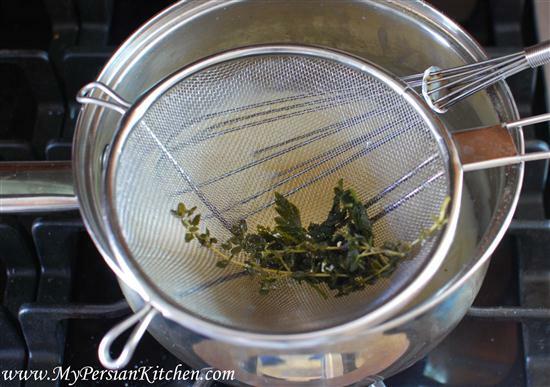 Add chicken pan juices to the Béchamel sauce using a strainer to leave out the herbs. 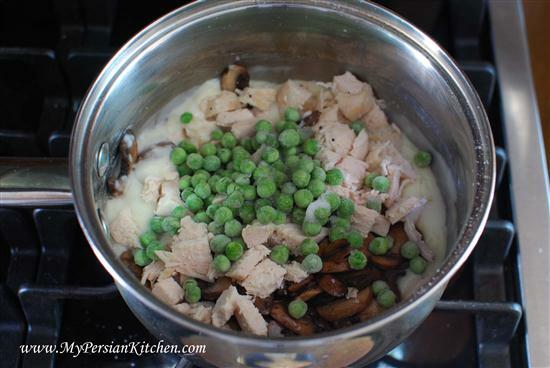 Add chicken, mushrooms along with the left over pan juices, and peas to Béchamel sauce. Adjust seasoning and let rest so that the flavors come together. 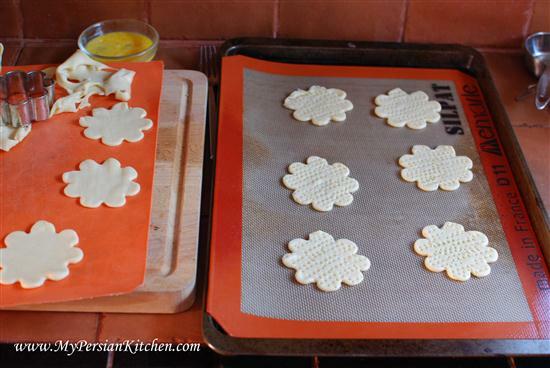 To make vol-au-vent cut out rounds of puff pastry and place them on a baking sheet. With a fork make indentations in the dough. Then brush with egg wash made with mixing egg wash.
Cut additional rounds and cut another circle in the middle of them. 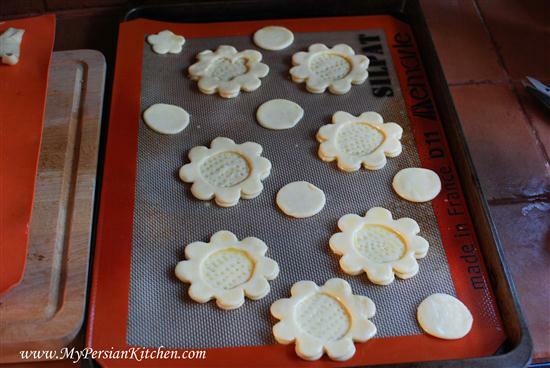 Place the rounds on top of the previous rounds and brush with egg wash. I only used one layer of puff pastry, but you can double or triple the layers to make your puff pastry cup higher. The more layers you add, the taller it will be. I personally like mine short so that they are easier to eat. While the puff pastry bakes, simmer chicken filling on low so that it warms up. Bake the puff pastry in 375° oven for about 20 to 25 minutes making sure to rotate half way through. 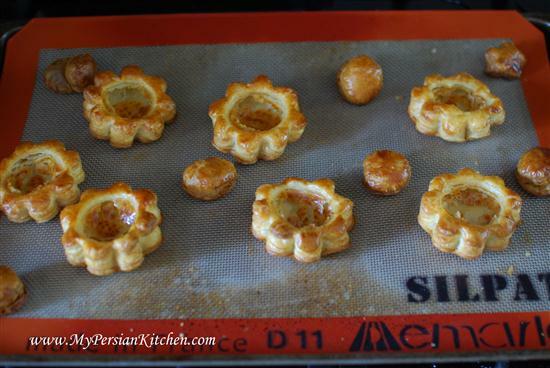 Once the vol-au-vent shells come out, gently press down the middle portion to create a well while they are still hot. Load the chicken filling into each vol-au-vent and serve. If you make the shells ahead of time, warm the filling and add to the shells then put in the oven for a few minutes so that the shells warm through. I hope you will enjoy these as much as we did. So simple, yet so good! A little side note for those of you who are lactose intolerant like me: I used Lactaid milk to make the Béchamel sauce and it worked out great! These look so yummy, Sanam. I will have to make these!! Denise, make them! Make them!!! They are so ridiculously good!!! 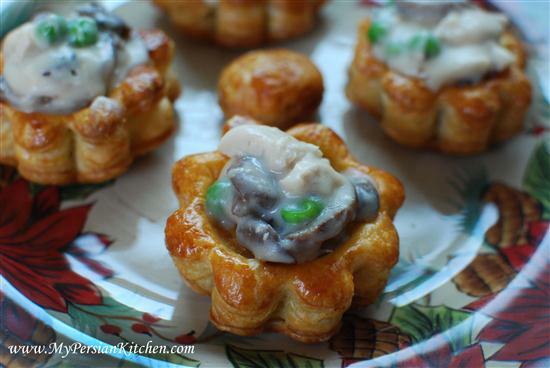 I used to love vol-au-vent as a kid and am so glad you shared this recipe! Will definitely have to try. I am also lactose-intolerant and have had great success with using Lactaid milk too to make bechamel and other sauces. Thanks MPK! Indian Cook in NY, I am definitely making these again! They were that good!!! These look fantastic. 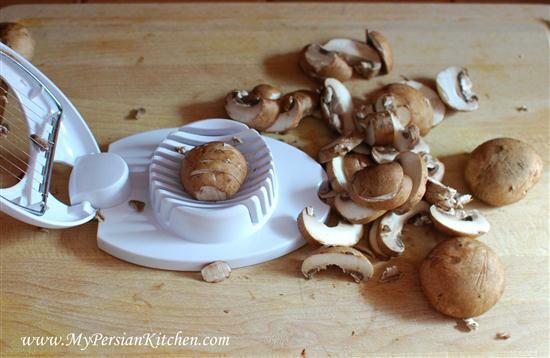 Btw, I, too, use an egg slicer to slice mushrooms. Can you use a gluten-free flour to make the Bechamel sauce? If so, is there one you recommend that works best? thanks! Hedie, I am think you probably can, as long as it works as a thickening agent. Try using rice flour and see how it works out! I’m new to your blog, chef, having found it while looking for a vol-au-vent recipe. I made this recipe a few days ago, also using boneless skinless chicken breasts. I used about half 1% milk and half 35% cream I had left over from Christmas as well as herbes de Provence and a pince of chives. It was to die for! My hubby and my son have asked for it to be served regularly. Of course, the cream was a one-time addition, 😉 Thanks for sharing this recipe.